Dependent upon the area and environment where you reside, it may not be unusual for your pool’s water level to differ day by day. Environmental factors such as humidity and/or wind can have an impact, causing you to lose approximately up to one quarter inch of water a day, or approximately 2 inches per week. How can I tell if my swimming pool has a leak? It’s tough to keep water in a pool. Every swimming pool, jacuzzi, or decorative pond is most likely going to leak eventually in its lifetime. These annoying issues can be more than just an inconvenience. An unrepaired hole the size of a pen’s tip can lead to hundreds of gallons of water lost daily. In addition to the replacement expense of the water itself, leakages in your swimming pool will definitely increase chemical demands, and could result in more severe structural and mechanical troubles. Thankfully, efficient, cost-effective pool leak detection options are available. What do I do if I suspect my pool has a leak? First, carry out “the bucket test” (below). If the test returns positive, repeat the test but the 2nd time, run your pool pump for 12 hours and look at the level. After that leave your pump off for 12 hours and look at that level. If the two measurements are equal, your pool leak is most likely not in your plumbing. 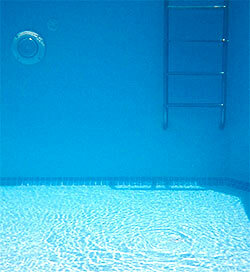 If the 2 measurements are not equal, there is a likelihood that the leakage is in the plumbing of your pool. The bucket test is a great tool to assist you in determining whether or not your pool or spa is leaking. It is highly recommended that you call Innovative Leak Detection and let our skilled professional technicians carry out our advanced swimming pool leak detection techniques in order to diagnose the source of your pool or spa leaks. At the end of the 24 hours check both of the water lines to see how much water has been lost. The inside water level is evaporation, the outside water level is the total pool water lost. The distinction in the two levels is the true amount of water lost from a leakage. If you are still noticing increasingly high water bills or any other symptoms of a water leak but the bucket test failed you could be dealing with a slab leak, plumbing leak, wall leak, or a sewer & drain leak. All of these are very serious and should be handled as soon as possible, Innovative Leak Detection excels in all residential leak detection and commercial leak detection applications, call us at 1-503-536-1199 immediately to prevent further damage to your property. Can I perform a pool leak detection myself? It all depends on where the leak is and how easy it is to see or detect. For example, if the leak is in a simple area to see, such as the middle of the skimmer, you could potentially use basic methods to find the leak yourself. On the other hand if the pool leak is in the same skimmer but under the basket ring, it might take an experienced pool leak detection specialist to find the leak. It is usually best to call us for expert advice before attempting to locate a leak. Whatever you do, do not let your pool leak until it stops, this is not good for your pool and can cause severe extra damage.